Graduate of any Business course; With background in accounting; Fresh graduates are welcome to apply. With Graphic Design skills; Layout skills, Creative Services, Customer Focus Creativity, Flexibility, Attention to detail, Desktop oriented, publishing tools, Acute vision, handle rejection, basic troubleshoot. 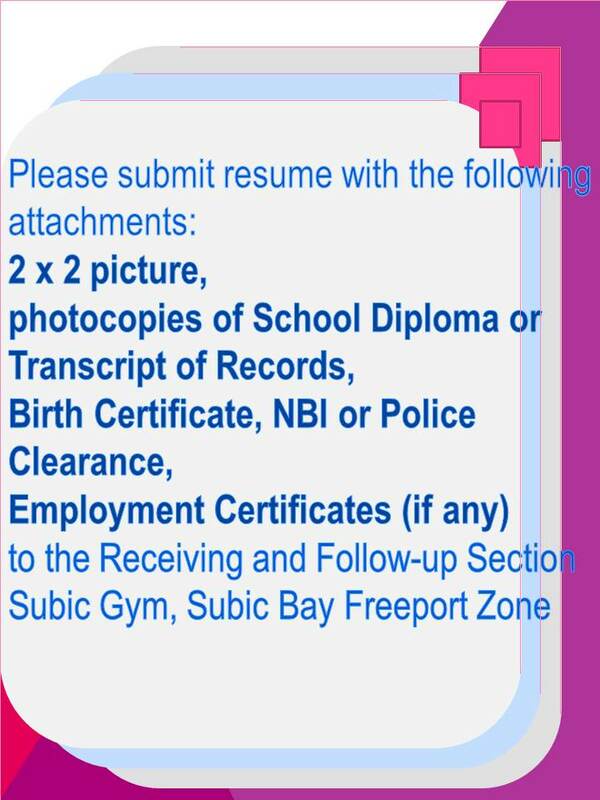 Applicants are advised to register at the Receiving Section, Subic Gym on/before APRIL 30, 2018 before proceeding to the Wistron Infocomm (Philippines) Corporation located at #4 Rizal Highway corner Aim High Avenue, Subic Bay Gateway park, Subic Bay Freeport Zone, from Monday to Friday, 10:00am (Exam) and 1:30pm (Interview) and look for MS. CRISTINA LIM. Male; Graduate of any 4 year related course / Vocational graduate; With at least 6 months experience as CAD operator or Fresh graduate are welcome to apply; Have knowledge in 2D and 3D dimensional drawings; Can prepare drafts and layouts of the given structure; Can calculate dimensions and allowance with accurate precision. Male; High school graduate; Flexible. Male; Must be a Licensed Driver (codes 1,2,3 & 4); At least 2 years’ experience in driving; Excellent driving skills and knowledgeable of traffic laws; Good driving record; Has a sense of direction and well knowledgeable in Metro manila routes; Good defensive driving techniques; Willing to work on weekends and shifting schedules. Female; Graduate of BS Accountancy; Must have good communication skills (Filipino and English); With or without experience; Possess good moral character. A Registered Nurse; Preferably has OCCUPATIONAL SAFETY and HEALTH (OSH) trainings (at least 40 hours); With two(2) to three(3) years related work experience in a hospital or industrial setting; With above average oral and written communication skills; Well knowledgeable in first aid and emergency treatment; Must be willing to accept shifting schedule. Automotive Vocational graduate / Bachelor’s or College Degree or equivalent; At least with two(2) years working experience in the related field; Must be practically and mechanically oriented; Physically fit; Can work on a flexible time and pressure. With pleasing personality; College level / College graduate; With good communication skills; Hardworking; Fresh graduates are welcome to apply. College level / High school graduate; Hardworking and responsible.